One of the easiest and perhaps most interesting ways for an individual to invest in a precious metal is purchasing 90% silver coin bags. Many buyers like this avenue as silver coin bag values move with the price of silver. Plus, they are usually more liquid, can be broken into smaller transactions, and they often are less expensive than other precious metals investment products. Bags of 90% silver coins usually contain pre-1965 circulated American coinage. They generally do not have numismatic value as they are in poor condition or are common enough that collectors have much better specimens in their collection. 90% silver coins meeting that criteria were given the label of “junk silver coins” years ago. However, bags of junk silver coins — or even individual strikes for that matter — are anything but junk in today’s economy. Their values have surged. 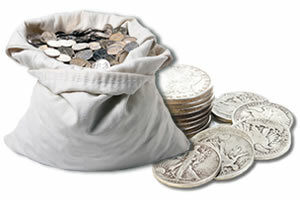 Often, 90% silver coins are bagged by dealers in lots totaling a face value of $100, $500 or $1,000. They are then sold for a slight premium above the current spot price of the silver contained within them. The $100, $500 or $1,000 face values make it easy for buyers and the sellers to calculate how much of the white metal is in each bag. That is because the United States Government used a proportionate amount of precious metal in each coin. For example, a silver quarter dollar is struck with approximately 25% of the amount of silver that is found in a dollar, a dime 10%, a 50-cent piece 50%, etc. Coin dealers usually agree that circulated silver coins have approximately 715 ounces of pure silver in them for every $1,000 of face value. That amount takes into account the wear and tear they likely received while circulating. (When struck by the Mint, that same $1,000 face silver coin bag originally had 723 ounces of silver in it.) Dealers usually apply a slight premium to the larger coins such as the half dollar and dollar strikes, as these normally have less wear since they did not circulate quite as much. At recent bullion prices, a $1,000 face value bag of 90% silver coins has become quite expensive. Using a spot price of $20 per ounce as a base, a $1,000 bag containing 715 ounces of the precious white metal would have a melt value of $14,300. Silver Mercury dimes were minted between 1916-1945. Containing approximately .07234 ounces of the precious metal, the Winged Liberty Head Dime was erroneously given the nickname of “Mercury” when first released. (It has held to this day.) That is because many had thought that the portrait shown on the obverse of the coin was that of the Roman messenger god Mercury. Instead, the design actually showcases Lady Liberty wearing a Phrygian cap, long associated as a symbol of liberty and freedom. The wings on the cap were placed there to symbolize freedom of thought. Adolph A. Weinman is credited with creating the design. Silver Roosevelt dimes were struck between 1946-1964. Also containing approximately .07234 ounces of the white metal, the Roosevelt Dime was issued to honor the former President of the United States Franklin D. Roosevelt. In fact, the movement behind a coin portraying the former President resulted in the debut of this coin occurring only nine months after he had passed away. The portrait of Roosevelt was completed by John R. Sinnock who at the time was the Chief Engraver at the U.S. Mint. Of interest, the coin marked the first time an employee of the U.S. Mint had created a design for a circulating coin of the United States in over 40 years. Typically, outside artists were brought in for this task. Silver Walking Liberty half dollars were struck between 1916-1947. Minted originally with .36169 ounces of the precious metal, the Walking Liberty Half Dollar was released as part of a process started by President Theodore Roosevelt to beautify the circulating coinage of the United States. His vision apparently paid off as the design found on the obverse of this coin portraying an image of Liberty walking is considered by many to be one of the most beautiful ever found on a United States coin. The design was completed by noted artist and sculptor Adolph A. Weinman — the same designer as the Mercury dime. Silver Franklin Half Dollars were minted between 1948-1963. Like the other 90% silver half dollars, the Franklin strike originally contained .36169 ounces of the white metal when issued. A portrait of one of America’s most famous founding fathers, Benjamin Franklin, can be found on the obverse of the coin. The reverse shows an image of the Liberty Bell. Beside the bell is a small eagle which serves as the national symbol of the United States. Interestingly, Franklin opposed the use of the eagle as the national symbol and instead preferred that of a turkey which he considered to be a more noble bird. John R. Sinnock is credited with both the obverse and reverse design. Silver Kennedy Half Dollars were produced between 1964-1970. Only available for one year in the 90% silver composition, the 1964 Kennedy Half Dollar also contained .36169 ounces of the precious metal. Like the Roosevelt Dime before it, the Kennedy Half Dollar was originally issued to honor a former President who had just died. In this case, the half dollar honors John F. Kennedy who was assassinated a mere three months before the Mint debuted the strikes. Gilroy Roberts is the designer on record for the obverse portrait while Frank Gasparro is credited with the image of the Presidential Seal on the reverse. Between 1965-1970, the Kennedy Half Dollar changed to have a composition of 40% silver. They moved to a clad composition in 1971. Silver Morgan Dollars were minted between 1878-1904, and then again in 1921. Likely to be the oldest strike one might find in a bag or roll of junk silver coins, the Morgan Dollar was originally struck with .77344 ounces of the white metal. They are nicknamed after the designer George T. Morgan who had recently been hired by the United States Mint to serve in the position of assistant engraver. The coins were the first silver dollars released by the U.S. Mint for domestic commerce in five years and were authorized to help stabilize the silver market by requiring the Mint to purchase the precious metal and strike it into coins. Silver Peace Dollars were produced between 1921-1935. Also containing .77344 ounces of the precious metal when first struck, the Peace Dollars were originally considered a commemorative to mark the end of World War I. The coins take their name from the fact that the word PEACE is inscribed on the reverse of the coin right below a perched eagle. The obverse of the strike contains a portrait of Lady Liberty. Both were the work of artist Anthony de Francisci. To check out modern U.S. Mint releases, visit the coins page of this site.